This summer and early fall has left many areas without essential rainfall for field crops and plants in home landscapes. However, many home gardeners do not look much above eye level when maintaining a landscape and with this approach our trees are easily looked over or ‘under’. Just like your raised beds and your lawns, the oldest trees in the landscape need water and nutrients. When there is a lack of essential elements the plants become stressed and less likely to fight off diseases and insect attacks. 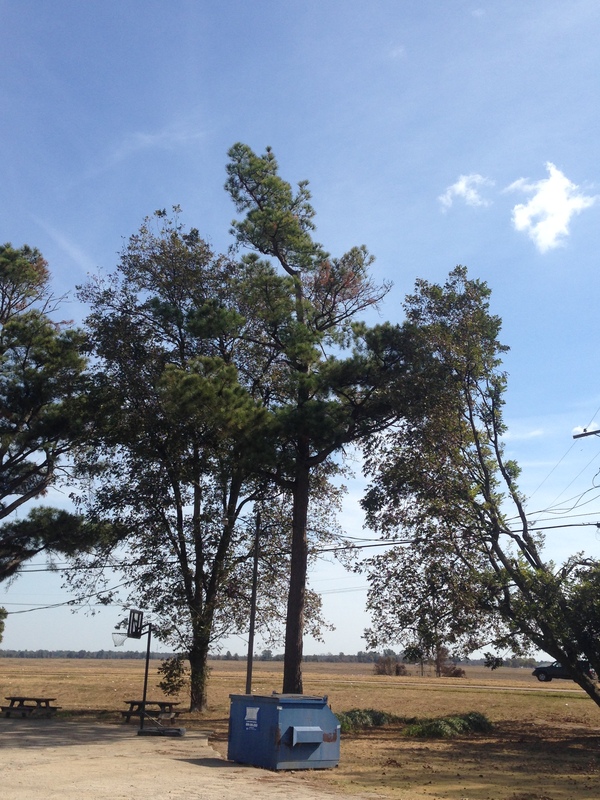 Even though the MS Delta is not known for Pine (Pinus spp) as the rest of the state, there are numerous pines in the home landscapes across the region. 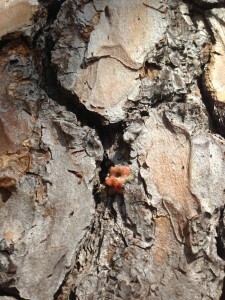 The drought has opened many of them up to pine beetle attacks. While there are many different beetles that can attack, we generally on focus on southern pine beetle (SPB), Ips species beetle, and black turpentine beetle (BTB). 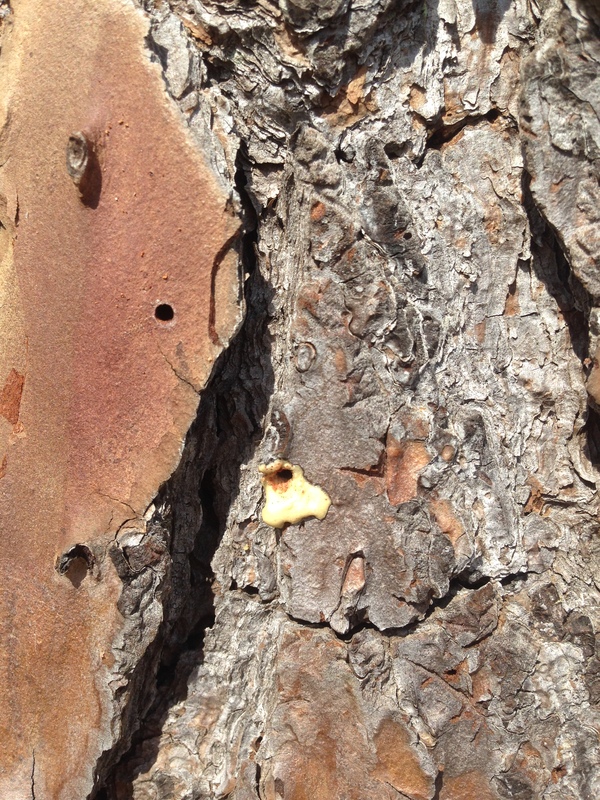 It is not common for the SPB to infest urban areas like the Ips and black turpentine beetle, however, the SPB has taken the wrap for the largest economic impact on the commercial industry where the stands of trees are dense and movement away from the original tree can occur easily. Ips beetle is about the same size as the SPB (1/6 to 1/8 Inch long) but will have spines located at the end of their abdomen and have light brown to red to a darker color as it matures.. Black turpentine beetle is much larger (3/8 inch) but has the same dark brown to black appearance as the SPB. These beetles bore into the trees and will excavate galleries girdling the stems to lay eggs just beneath the bark and the larvae will feed until maturity and exit through the bark give a “shot-hole” appearance. “Shot-hole” emergence made by mature beetles exit. These steps will be repeated throughout generations can overwinter in lower portions of stems, stumps, and felled trees. Ips beetle carry spores of a fungus that disrupts the vascular system not allowing water to reach the top causing death. BTB and SPB will release pheromones calling others to the tree and when populations get high the girdling of the stem does the same as the fungus. Since it is rare to see some of these beetles it is best to know some of the signs and symptoms that an infestation will exhibit. First you will see portions of the crown die back. Upon closer inspection you will find pitch tubes if the tree is still able to form resin. Entry point made by beetles forming pitch tubes. 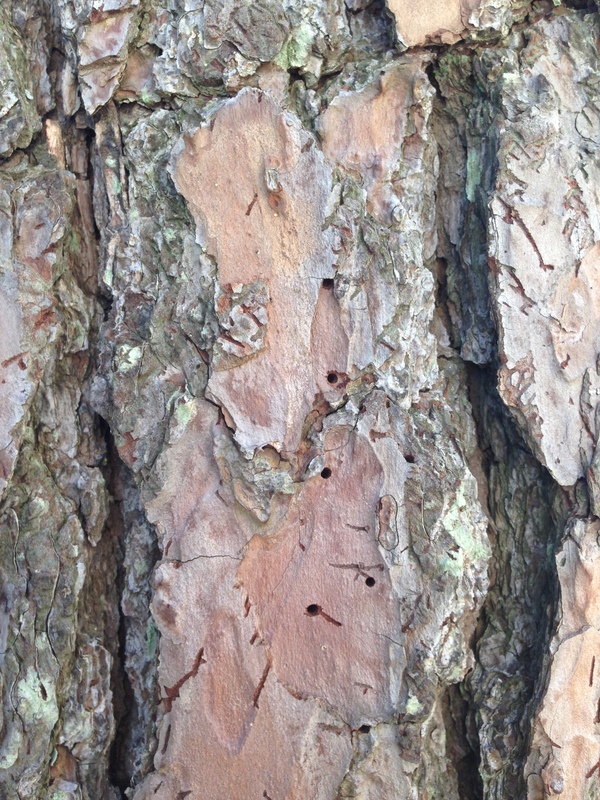 Other observations would be boring dust around the tree or just outside the bark, increased woodpecker activity, sloughing bark, shedding limbs, and galleries beneath the bark. Boring dust (frass) caught in resin. 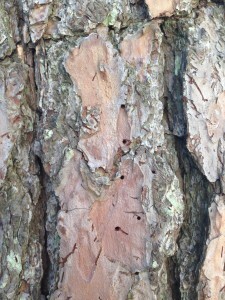 Generally homeowners will not notice the problem until the pine has exhibited red topped or severe decline in the crown. At this point it is very unlikely that it will live. 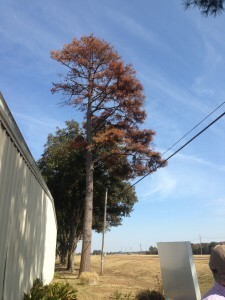 Pine that has been severely damaged. The best management for these beetles in an urban setting is to keep them in an optimal growing environment. Make sure the most established trees as well as newly placed trees receive at least 1 inch of water per week. Maintain proper fertility and reduce acts of compaction or disruption of roots. Routine pruning should be done correctly and during winter. 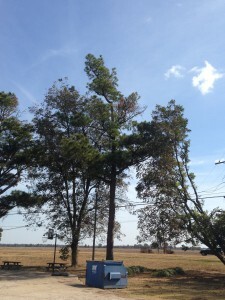 If trees on the property have been attacked be sure to cut and remove/destroy all portions of the tree. 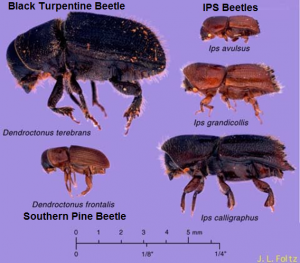 According to an article written by Dr. Blake Layton, Extension Entomologist, there are a few chemical options available to homeowners to control BTB and SPB but since Ips beetles stay in the crown sprays are ineffective. Formulations of permethrin can be sprayed multiple times of year by a homeowner to get a longer span of control while a licensed professional can use a products called Onyx that will last much longer each time it is sprayed. Always read and follow label directions. Most of the time chemical control is not economical due to cost and the way it is applied. In order to have an effective trunk spray you must wet the bark until the point of drip and also spray 10-12 ft for BTB and at least up to the bottom live branches or middle of the crown for SPB. Since Ips beetles live in the crown sprays are very ineffective. For the most part pine beetles need a weak tree to attack so tree health is the best defense. Remember that the trees need just as much care as the flowers planted next to the mailbox. Preventative maintenance such as providing adequate fertilization and water will provide the trees and other plant materials with the health to help fight off insect and disease pressure. 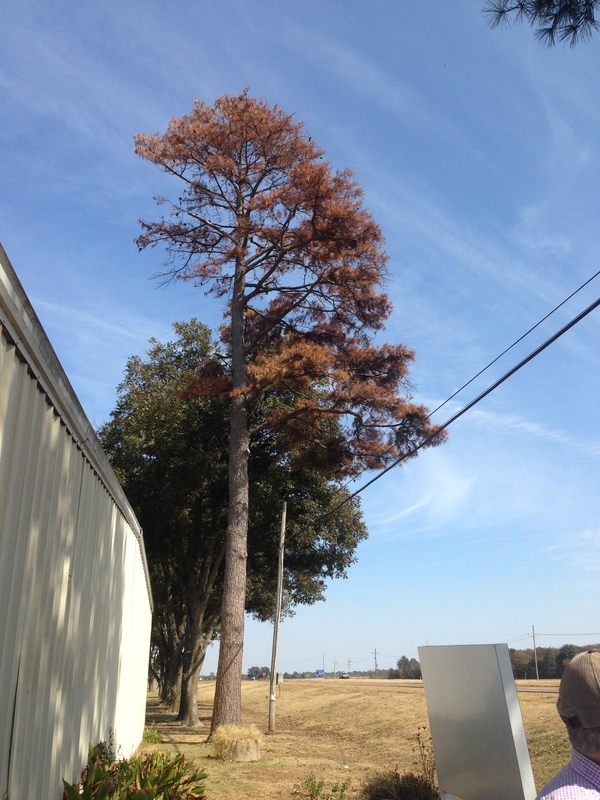 Remove and destroy all infected material and correctly prune injured trees to reduce the likelihood of decline. Contact your local extension office and also visit P2369 Insect Pests of ornamental plants in the home landscapes http://msucares.com/pubs/publications/p2369.html. Last updated October 28th, 2015. Technical problems, contact support.